You may well be aware that, the Government has made some changes to GCSE Examinations. It says that this change is to ensure that young people have the knowledge and skills they need to be better prepared for work or further study. The examinations are designed to be more challenging to match the highest performing education systems elsewhere in the world. Students in the current Year 12 sat the newly reformed Maths and English GCSEs – these had no coursework, an increase in exam time and an increase in content to be learned. For these subjects the changes do not yet and students will be graded A*-U, as previously. 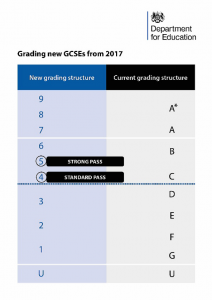 The other GCSE subjects have a new 9 to 1 grading system. Grade 9 is the highest grade and will be awarded to fewer students than the current A*. Although the grades from the old to new GCSE do not directly compare, here is the DfE information on how they loosely align. You will see that the grade 7 matches the bottom of the old A grade, the grade 4 matches the bottom of the old C grade and the grade 1 matches the bottom of the old G grade. Although the exams cover more challenging content, the same proportion of students will achieve a grade 1, 4 and 7, as would have achieved a grade G, C or A in the old exams. A grade 4 is the standard pass in English and Maths – for this year, all students will need to have achieved this, otherwise they will need to continue to study it at post-16. Employers, universities and colleges are allowed to set the GCSE grades they require for employment or further study. For this year, they are currently being told by the government that the nearest equivalent to the previous grade C is a grade 4, which is what they should be asking for as a minimum. Nationally, the measures will be the percentage of students achieving a standard pass (grade 4 and above) and the percentage of students achieving a strong pass (grade 5 and above, loosely equivalent to an old GCSE grade C+, B-). As a result, it is likely fewer students this year will achieve a grade 5-9 in English and Maths, compared to previous achievement of grades A*C.